It has been proven time and time again that dancing is good for a person’s health. From improved memory to reduction of pain and improved gait, elderly and injured individuals have a lot to gain from a dance class. Moreover, the stretches, exercises, and precise movements found in many dance forms can help those who suffer from balance issues by 1) helping them strengthen their core, and 2) pushing them to practice balancing in challenging situations. Since so many of our patients suffer from balance issues, we found this news quite appealing, and wanted to share our findings with you. Because dance is a fun and social activity, we find that it is a wonderful addition to physical therapy and a fun way to reinforce the things learned in therapy sessions. In fact, a person using dance as therapy might even find themselves having so much fun that they continue lessons long after their ailments have been addressed. Are you curious about using dance as an extension of balance therapy? 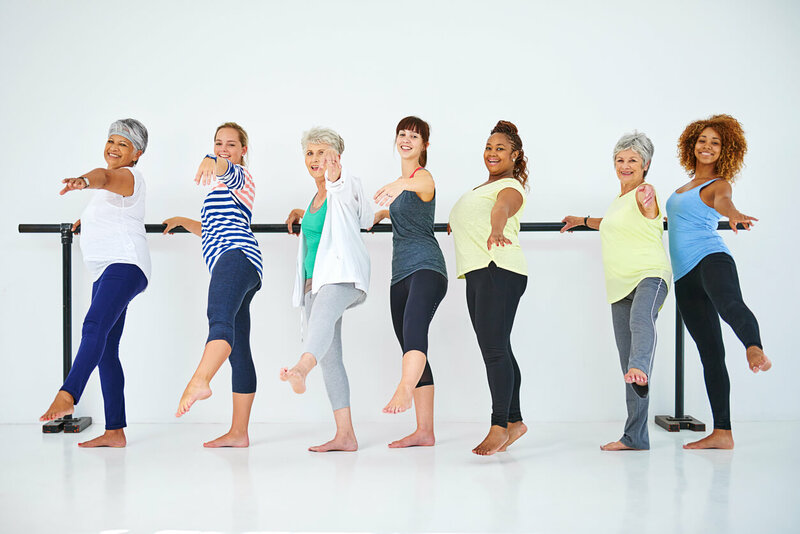 Read on to learn which dance forms are best for helping a person find their center of balance and reduce their risk of falling. With an intense focus on barre work and other muscle-building exercises, ballet is a wonderful dance form for anyone to pick up. A good ballet teacher will focus intently on technique, ensuring the proper placement is being used and helping the dancer become more aware of their body positioning and the way it affects their balance. Additionally, the exercises included in a ballet class will help dancers build their core muscles, which are essential for good balance. Ballet classes can be found in almost any dance studio. Additionally, classes are available for people of all ages, meaning even older adults can pick up this graceful dance form. There are a wide range of social dance forms out there that are both incredibly fun and wonderful for a person’s health and balance. From Irish and Scottish céilí (kay-lee) dancing to English contra dancing and American square dancing, most social folk-dance forms are pretty low-impact, making them perfect for those who need to go easy on their joints. While there is less emphasis on proper form in most folk-dance sessions, there is still a lot to be gained from the simple dance moves done in these classes. Because the dances are so easy to learn, dancers can really focus on where their weight is and ensure their balance is in constant check. That said, these dance classes can be fast-paced, meaning those with severe balance issues may find themselves in over their heads. Make sure to notify your instructor if/when you feel you should sit out, and ask him or her to let you know beforehand if any given dance will be particularly difficult. Tap-dance is great for those who need to focus on balance because it requires the dancer to switch weight often throughout any given piece. Additionally, many tap instructors opt for very relaxed arm placement, which allows the dancers to use their arms to assist them in keeping their balance. That said, tap should be coupled with a second dance form or another type of therapy to ensure that the proper core muscles are being developed. Additionally, because tap can pick up pace quickly, it is important that those with balance problems ensure they are enrolled in a slow-paced beginner class. Senior clogging classes can be a good alternative to tap because they tend to take things a bit more slowly. Although it isn’t a true dance form, we feel yoga is a perfect addition to this list. It incorporates many aspects of dance and focuses intently on muscle development and balance, both ideal for anyone who has trouble balancing on a day-to-day basis. There are many yoga positions that are ideal for improving balance. For instance, mountain pose, tree pose, and dancer pose all require that the person tune into their body in order to balance. Therefore, a person holding any one of these positions will get an excellent feel for the positioning of their body and how to balance in that particular position. Additionally, because yoga tends to be slower-paced, they would have time to make small adjustments to improve their balance and to practice using their eyes for balance assistance. The skills gained in yoga practice can be applied in daily life when the person assumes similar positions, and will even carry over into the simplest of tasks, such as walking. Because yoga is a hugely popular exercise activity at the moment, it’s easy to find a class geared to almost any age group. This includes parent-child classes for those who have trouble finding childcare, as well as senior classes for those older adults looking to find their balance. An excellent form of exercise—and another activity that, like yoga, almost doesn’t qualify as dance—Pilates is ideal for those suffering from loss of balance. This fun exercise focuses on both muscle-building exercises and proper posture, and requires that participants focus intently on their balance. It is a bit more intense than yoga, so it’s a good option for those who have tried yoga and would like something a bit more difficult. Pilates is not as prevalent as ballet or yoga, so it may be a bit more difficult to find a Pilates class in your area or at your level. However, there are plenty of video lessons available for anyone who’d like to try Pilates in their own home. Of course, dancing cannot and should not replace therapy entirely. If you need to begin therapy for your balance issues, it is important to begin your therapy sessions and discuss the possibility of dancing with your physical therapist before your first dance class. Are you looking for a physical therapist to help you with your balance problems? Please feel free to see us at Orthopedic and Balance Therapy Specialists to get more information about our programs.